The intriguing thing about this journey is that it makes use of the vast network of interconnected waterways which link together central Europe. Prague is on the Voltava, Dresden is on the Elbe and Berlin is on the Spree, and where there is not a river there is a canal which ingeniously links them all together. Prague is famous for its Baroque architecture, one of Nicholas’ lectures will shed some light on that subject. It is a city well suited to the walking tour. Prague Castle on Hradcany hill dominates the city with its neighbouring St Vitus Cathedral. Surely the only the cathedral in the world with a window by the Art Nouveau artist, Alphonse Mucha? 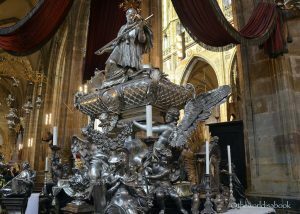 The most astonishing monument in the cathedral is to the local saint, St John Nepomuk, it must be 20 feet high and is made of solid silver. 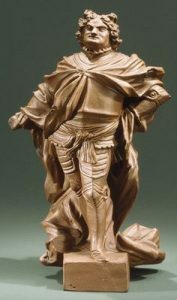 This is Baroque personified. On leaving the palace complex. Do try to go into the Lobkovitz collection, this palace has been “restituted” to its original owners, and contains wonderful objects including a magnificent Canaletto of London’s river as well as arms and armour, ceramics and annotated manuscripts by Beethoven, Haydn and Mozart. All beautifully arranged with an excellent audio system. Dresden is the capital of the Saxony, and renowned, quite rightly, as the “Florence of the Elbe”. Its staggering architecture owes much to its mineral wealth from the Erzgebirge mountains which supplied the German silversmiths of Nuremberg and Augsberg in the 17th and 18th centuries with a ready supply of their raw material. Encouraged by the extravagant Augustus the Strong in the early 18th century the city achieved fa me as a centre of sumptuous court life. In nearby Meissen, the secret of true European porcelain was discovered in 1710, a new medium for Augustus’s luxurious ways. The Art Gallery is one of the finest in Germany overlooking the parade ground, the Zwinger, created by Augustus. It contains works by Italian, Dutch and French masters and also by Bernardo Bellotto, nephew of Canaletto, who is famous for his views of Dresden in its prime. 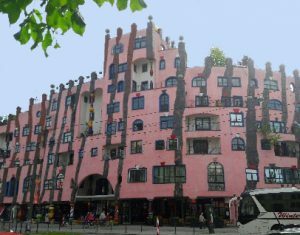 Both Wittenberg, famed for its association with Martin Luther and the Protestant Reformation, and Middleberg contain buildings by the eccentric architect Friedensreich Hundertwasser. Not a man for conforming, he built polychrome buildings without a straight line, and in the case of the Green Citadel in Middleburg, covered the building with vegetation, hence its name. Even his death was unusual, on board the QE2 and buried at sea. 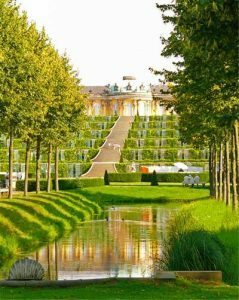 Potsdam, a short distance from Berlin, comprises a number of palaces set in an idealised landscape of fountains and statuary, and is frequently likened to Versailles in its layout. One of the palaces, Sans Souci, was very much the brainchild of Frederick the Great, the longest reigning of the Hohenzollern kings of Prussia, (1740-86), who was a considerable warrior and patron of the arts. The rococo, domed building was built largely by the French and Italian trained Wenzeslaus von Knobbelsdorf, a protégé of Frederick, who was much taken by the French enlightenment and was a correspondent of Voltaire. For those wishing to spend more time in Berlin a two night extension is available. PRICE INCLUDES: Economy class scheduled air travel • Eight night’s accommodation aboard the MS Elbe Princesse on an all-inclusive, full-board basis (excluding premium brand alcohol) • Shore excursions • Cruise Director • Tour Manager • Guest Speaker • Gratuities • Transfers • Port taxes • Airport taxes.